What’s up guys! Have you install the Best Anemone themes around Cydia? Well, i have listed the best Cydia Compatible Anemone themes for iOS 12.1.2-12, iOS 11.2 – iOS 11.3.1 and older version 11.1.2, 11.1.1, 11, 10.2.1/10.2, iOS 10 & iOS 9 for iPhone X, iPhone 8 Plus, iPhone 7 Plus or below. Anemone themes are freshly designed for all iPhone, iPad & iPod touch which changes your HomeScreen layout in a beautiful way. Visualize your iOS 11 home screen icons, docks, badges, UI, folders, bootlogo and more on your iPhone, iPad and iPod touch with these best anemone themes. As iOS devices looks bit dull with the stock icon theme by default and you might be bored using same default iOS theme of your device so it’s time to give some refreshment to theme iOS 11/10 devices & below. All these best Anemone themes are compatible with iOS 12,11,10,9 or later which helps your devices look amazingly beautiful. Installing Anemone Themes on iOS 12.1.2-12, 11.2 – iOS 11.3.1 and older iOS version 11.1.2/11.1.1/11, iOS 10 and iOS 9 or below is very easy. Just you need to download the Anemone app and Anemone Compatible themes from Cydia. After downloading the Anemone and its themes, go back to Homescreen and open Anemone app and will see the list of Anemone themes you have downloaded. To install the those anemone theme, simply tap on Enable & Apply. All these iOS 12 AND iOS 11 Anemone themes below listed are the best and are available via ZodTTD & MacCiti repo. You can download Anemone themes from Cydia. So let’s check some Top and Best compatible Anemone themes for iOS 12, 11, iOS 10 and iOS 9 that supports all iPhone X, iPhone 8 – 8 Plus or below and iPad’s and iPod Touch. Acai is the fun, colourful themes which includes hundred of icons, control center theme, wallpapers, signal , wifi themes, respring logo and more. Edition is a transparent theme that gives you a unique touch to your device which includes hundred of icons, special badges, docks, amazing sounds, bootlogo and more. 0bCeZ9 OrAnGe is a awesome theme and its free who had already purchase the main theme. Salvation9 is a red theme and just a basic theme taking stock ios icons and giving them a more personal meaning which contains 150+ themed icons and more. It supports all devices running iOS 7 or later. 1nka iOS 9 is one of the best theme which contains a nice with more than 590 awesome icons with unique style, docks, badges, folders effect, UI and more. Aragon is awesome and detailed theme comes with 450 icons, full and detail UI, cccontrols theme, dail pad, battery bar, zeppelin logo, iconomatic shadow and more. You must have this theme. Rein is a dark, simplistic theme with dark based icons and gradient colors which includes 21 Anemone/Iconomatics effects, 6 dock, 2 badges and more. If you love dark theme then this one will be the best for you. It is also available in round icons. You can have many options to configure you want on the Anemone App. Blackie is a brand new theme which brings an abstract and a dark look for your device which contains over 300 icons, a custom control center, custom badges, custom status bar, custom and spider man boot logo. This theme comes with three different styles; circle, squircled and classic. It is compatible with iOS 7 or higher. You can have options to configure from the Anemone app. CandyCane is a nice white theme which comes with three different styles with nice icons effects and more. Gentleman is the theme which brings you a touch of color and freshness with nice mustard bootlogo, 200 icons, loading effects, battery bar, network bar and much more. Gentle is a nice theme which I like the most and is compatible with iOS 7 or higher. Ghost is another dark theme designed by same Rein theme developer. It is a free and modification version of above Rein theme which with nice umbrella boot logo, battery icon and more. Nagasari is a beautiful light Anemone theme which contains more than 270 icons, folders, dock, badge, icons effects and more. This theme is optimized for Anemone only and is compatible with iOS 7 or higher. VisionHD is a beautiful transparent theme which contains more than 950 icons with unique style, docks, badges, magic dots and widgets. You can many options to configure from the Anemone app. ReOs is unique theme which includes over 200 themed icons, 10 wallpapers, control center, Lockscreen UI elements and passcode buttons, Respring logos, custom spinning wheel, iMessage UI elements and much more. Bluri is beautiful theme with hot and clean and clear icon pack which contains number of icons, nice control center and supports all retina and non retina iPhones and iPads. Quada is a unique material design theme for iOS which features over 300 icon, icon mask, settings icon, IU and more. Syren is a nice black theme contains nice icons, bootlogo, folders, loading, buttons and much more. This is handmade icons based theme with unique look which contains high quality awesome icons, dock and more. Material Cards for iOS works on both Anemone and Winterboard and supports all iPhone, iPad and iPod touch running iOS 7 or higher. This theme is great and is one of my favourite. Frugal is the best Anemone theme that gives a unique touch to your device which includes a custom dock, sounds, bootlogo, icon effects, wallpapers and more. Frugal supports with all iPhone, iPad and iPod touch running iOS 8 or higher. AnnaBelle is a unique theme which offers 600 custom icons, bright, round with vector graphics. This theme supports all device and is compatible with both Anemone and winterboard. Espiro is a clean and beautiful with high resolution icon pack conatains more than 700+ HD icons which support all retina and non retina devices. 7 also includes widgets and wallpapers and is compatible with Anemone only. 360 ios9 is the most popular theme and is now updated with circular silver ring style and includes iwidgets, wallpaper and more and is compatible with iOS 9. Lotus is very nice theme created by Orenjiiiro with an idea of different colors of a flower which can be organized by its transitioning effect from blue to green or red to yellow. iOS 9 Gradience is very nice theme for your device which looks like stock iOS 9 and features two themes, classic blur icons, images, signal bar, settings app and more. Ambre is a nice flat design like never before. Ambre contains more than 1110 awesome icons with unique styles, 6 docks, 4 badges, 6 floders, UI, Settings, zeppelin, clock widget and more. Evolve is a beautiful flat, colorful and relaxing theme compatible with all retina iPhones which has 200+ icons and full settings theme. Twist is very nice and beautiful theme with twist icon pack by @SyedFG which contains a number of round icons. Currently I have install this theme on my iPhone. I like it very much. Allegro is a nice theme by dabagg( @dexterilgatto) which contains 18 awesome Anemone effects, one shape available in 18 colors, number of icons, status bar, settings, control center, widgets, walls, UI sound, bootlogo and more. 2D Remix is an amazing theme that gives a unique touch to your device which includes cutom dock, sounds, icons settings, bootlogo, wallpapers and more. 2D Remix is compatible with all iPhone , iPad and iPod touch running iOS 9 or later and supports both Anemone and Winterboard. Phix is an anroid style theme which contains more than 780 awesome icons with unique style, docks, badges styles, folders, magic dots, UI and more. Lucid is a very simple and elegant theme which offers number of icons, phone dialer, passcode keypad, respring/reboot screen, UI elements, and more. Brass Tacks is nice white and gold combination which makes your icons look beautiful. BaSal is nice dark theme which contains 200+ icons, settings icon, magic dots and anemone effects. Aurora is an elegant and toned theme which comes with icons pack and supports both Anemone and Winterboard. Array is a beautiful theme which contains 260 icons, icon mask, and much more. Works with all retina devices running iOS 9 or later and is compatible with Anemone and Winterboard. Step 4: Install any platform Either ‘Anemone’ or ‘Winterboard’ & enable downloaded themes from there. Note: For Winterboard you must use IcondBundles. That’s it. 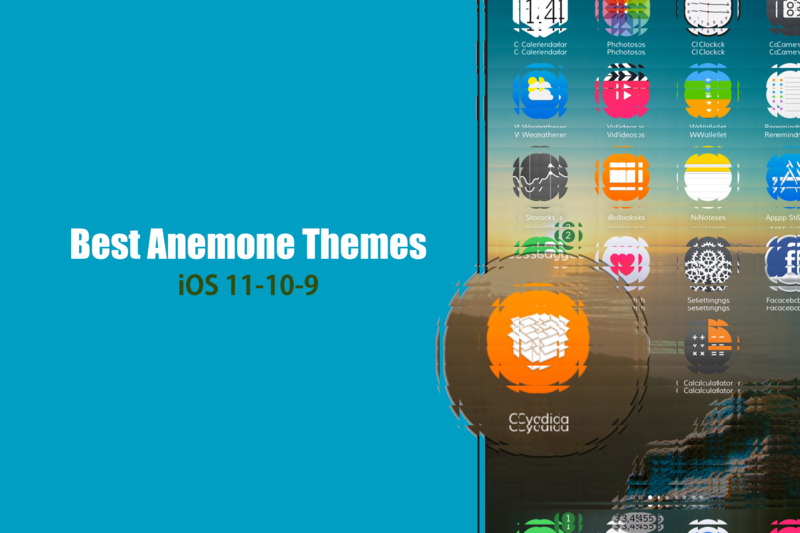 Enjoy and feel with your new look of your device with all these best Anemone themes for your iPhone.